Brain diseases frequently manifest them first as changes in the hemodynamic status of brain tissue, before structural damage can be proven by anatomical imaging. Additionally, perfusion changes upon neuronal activation provide a precise method to map cognitive processes. 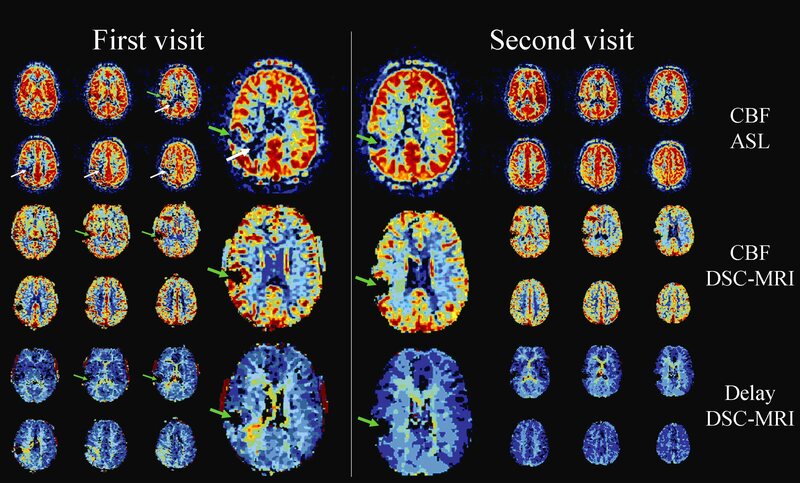 Magnetic resonance imaging (MRI) provides two methods to measure cerebral perfusion. The first method, dynamic susceptibility contrast MRI (DSC-MRI) monitors the first passage of a bolus of contrast agent through brain tissue. The second method, arterial spin labeling (ASL), is based on magnetically inverting the magnetization of the arterial blood flow and is therefore completely non-invasive. Quantification of DSC-MRI is mainly improved by optimization of the arterial input function measurement. Based on classical physics theory, simulations, phantom experiments and in vivo evaluation the measurement of concentration contrast agent in large brain feeding vessels, like the MCA, is made more quantitative. Furthermore, it is anticipated that moving the arterial input function measurements higher into the vascular tree will decrease artifacts in DSC-MRI due to smaller delay and dispersion effects of the bolus-passage curve. The newest ASL sequences, like pseudo-continuous ASL with background suppression were implemented on 3 and 7 Tesla Philips MRI scanners. It was shown that these sequences provide optimal image quality, enabling for example the depiction of ASL signal in the white matter. Furthermore, flow territory mapping techniques were developed that enabled both superselective ASL as well as planning-free flow territory mapping. Current research focuses on using ASL as a pre-pulse to quantitative MRI techniques to provide more information on the status of the microvasculature (like oxygenation, arteriolar vessel wall condition, etc) as well as reactivity measurements by ASL under lower-body-negative-pressure, hypercapnia and hypoxemia challenges. Both techniques are currently applied in clinical studies, like in patients with AVMs, migraine, and in pharmacological MRI. This project started in November 2004. Figure 1: Arterial spin labeling and dynamic susceptibility contrast MRI in a male subject with a partially treated cerebral arterio-venous malformation (region of embolisation shows as signal loss, see green arrows). ASL shows white matter hypo-intensity (left pane, upper 2 rows, see white arrows). DSC-MRI shows no CBF changes in the corresponding brain areas (left pane, middle 2 rows), but shows delayed arrival of contrast agent (right pane, lower 2 rows). During the second visit, 7 months after the first visit and after a second – almost total - embolisation, the hemodynamical deficit is absent both on ASL as well as on the CBF and delay map of DSC-MRI (right pane). Figure 2: Planning-free flow territory mapping by arterial spin labeling in a healthy volunteer showing the main flow territories (Red: posterior circulation, Green: left internal carotid artery, Blue: right internal carotid artery). Figure 3: Optimal locations for arterial input function measurements near the MCA for three different sized vessels and four different acquisition techniques (from left to right: single shot EPI, short echo time segmented EPI, long echo time segmented EPI, and PRESTO). This research is made possible by a VENI grant of the Dutch Technology Foundation (STW-7291), a VICI grant (016.160.351), STW-projects (STW-11047, STW-14951, 14729 (together with Hartstichting-CVON)) . Eidrees Ghariq was funded by the excellent student program of the LUMC. Cerebral blood flow in presymptomatic MAPT and GRN mutation carriers: A longitudinal arterial spin labeling study. Dopper EG, Chalos V, Ghariq E, den Heijer T, Hafkemeijer A, Jiskoot LC, de Koning I, Seelaar H, van Minkelen R, van Osch MJ, Rombouts SA, van Swieten JC. Neuroimage Clin. 2016 Aug 3;12:460-5.
van de Haar HJ, Jansen JF, van Osch MJ, van Buchem MA, Muller M, Wong SM, Hofman PA, Burgmans S, Verhey FR, Backes WH. 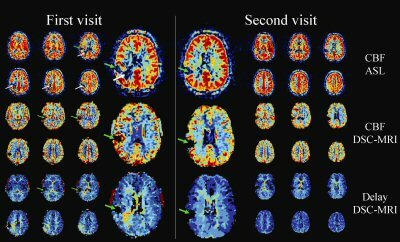 Neurovascular unit impairment in early Alzheimer's disease measured with magnetic resonance imaging. Neurobiol Aging. 2016 Sep;45:190-6. Warnert EA, Verbree J, Wise RG, van Osch MJ. Using High-Field Magnetic Resonance Imaging to Estimate Distensibility of the Middle Cerebral Artery. Neurodegener Dis. 2016 Jul 23;16(5-6):407-410. Bronzwaer AS, Verbree J, Stok WJ, van Buchem MA, Daemen MJ, van Osch MJ, van Lieshout JJ. Cardiovascular Response Patterns to Sympathetic Stimulation by Central Hypovolemia. Front Physiol. 2016 Jun 20;7:235. Kleijwegt MC, van der Mey AG, Wiggers-deBruine FT, Malessy MJ, van Osch MJ. Perfusion magnetic resonance imaging provides additional information as compared to anatomical imaging for decision-making in vestibular schwannoma. Eur J Radiol Open. 2016 Jun 15;3:127-33. Fällmar D, Lilja J, Velickaite V, Danfors T, Lubberink M, Ahlgren A, van Osch MJ, Kilander L, Larsson EM. Visual Assessment of Brain Perfusion MRI Scans in Dementia: A Pilot Study. J Neuroimaging. 2016 May;26(3):324-30. Liemburg EJ, Dlabac-De Lange JJ, Bais L, Knegtering H, van Osch MJ, Renken RJ, Aleman A. Neural correlates of planning performance in patients with schizophrenia - Relationship with apathy. Schizophr Res. 2015 Feb;161(2-3):367-75. Verbree J, Bronzwaer AS, Ghariq E, Versluis MJ, Daemen MJ, van Buchem MA, Dahan A, Van Lieshout JJ, van Osch MJ. Assessment of middle cerebral artery diameter during hypocapnia and hypercapnia in humans using ultra high-field MRI. J Appl Physiol 2014 Nov 15;117(10):1084-9. 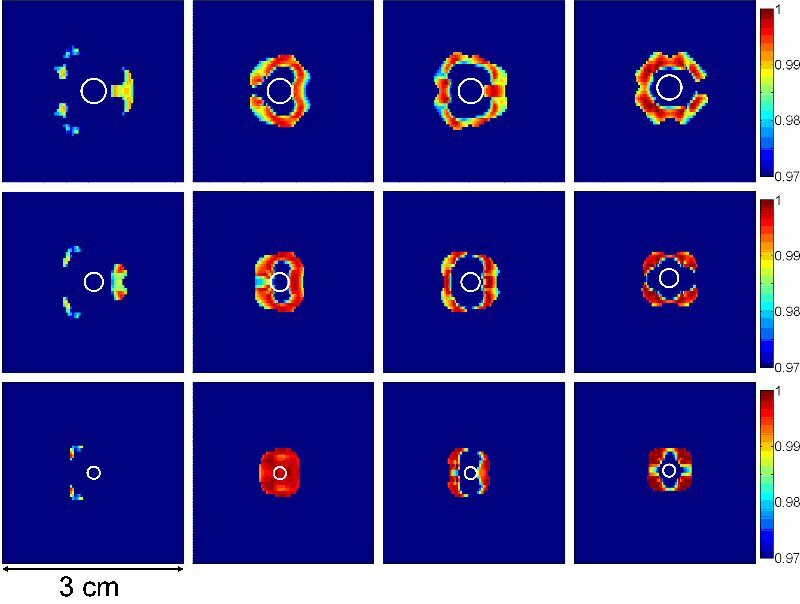 Rydhög AS, van Osch MJ, Lindgren E, Nilsson M, Lätt J, Ståhlberg F, Wirestam R, Knutsson L. Intravoxel incoherent motion (IVIM) imaging at different magnetic field strengths: What is feasible? Magn Reson Imaging. 2014 Dec;32(10):1247-58. Mutsaerts HJ, Steketee RM, Heijtel DF, Kuijer JP, van Osch MJ, Majoie CB, Smits M, Nederveen AJ. Inter-vendor reproducibility of pseudo-continuous arterial spin labeling at 3 Tesla. PLoS One. 2014 Aug 4;9(8):e104108. Teune LK, Renken RJ, de Jong BM, Willemsen AT, van Osch MJ, Roerdink JB, Dierckx RA, Leenders KL. Parkinson's disease-related perfusion and glucose metabolic brain patterns identified with PCASL-MRI and FDG-PET imaging. Neuroimage Clin. 2014 Jul 3;5:240-4. Schlumpf YR, Reinders AA, Nijenhuis ER, Luechinger R, van Osch MJ, Jäncke L. Dissociative part-dependent resting-state activity in dissociative identity disorder: a controlled FMRI perfusion study. PLoS One. 2014 Jun 12;9(6):e98795. (IF: 3.53). Alsop DC, Detre JA, Golay X, Günther M, Hendrikse J, Hernandez-Garcia L, Lu H, Macintosh BJ, Parkes LM, Smits M, van Osch MJ, Wang DJ, Wong EC, Zaharchuk G. Recommended implementation of arterial spin-labeled perfusion MRI for clinical applications: A consensus of the ISMRM perfusion study group and the European consortium for ASL in dementia. Magn Reson Med. 2015 Jan;73(1):102-116. Knutsson L, Lindgren E, Ahlgren A, van Osch MJ, Markenroth Bloch K, Surova Y, Ståhlberg F, van Westen D, Wirestam R. Reduction of arterial partial volume effects for improved absolute quantification of DSC-MRI perfusion estimates: Comparison between tail scaling and prebolus administration. J Magn Reson Imaging. 2014 Mar 24. [Epub ahead of print]. Heijtel DF, Mutsaerts HJ, Bakker E, Schober P, Stevens MF, Petersen ET, van Berckel BN, Majoie CB, Booij J, van Osch MJ, Vanbavel E, Boellaard R, Lammertsma AA, Nederveen AJ. Accuracy and precision of pseudo-continuous arterial spin labeling perfusion during baseline and hypercapnia: a head-to-head comparison with ¹⁵O H₂O positron emission tomography. Neuroimage. 2014 May 15;92:182-92. Teeuwisse WM, Schmid S, Ghariq E, Veer IM, van Osch MJ. Time-encoded pseudocontinuous arterial spin labeling: Basic properties and timing strategies for human applications. Magn Reson Med. 2014 72(6):1712-22. Mutsaerts HJ, Richard E, Heijtel DF, van Osch MJ, Majoie CB, Nederveen AJ. Gray matter contamination in arterial spin labeling white matter perfusion measurements in patients with dementia. Neuroimage Clin. 2013 Nov 15;4:139-44. Hartkamp NS, van Osch MJ, Kappelle J, Bokkers RP. Arterial spin labeling magnetic resonance perfusion imaging in cerebral ischemia. Curr Opin Neurol. 2014 Feb;27(1):42-53. Knutsson L, Lindgren E, Ahlgren A, van Osch MJ, Bloch KM, Surova Y, Ståhlberg F, van Westen D, Wirestam R. Dynamic susceptibility contrast MRI with a prebolus contrast agent administration design for improved absolute quantification of perfusion. Magn Reson Med. 2014 Oct;72(4):996-1006. Hartkamp NS, Helle M, Chappell MA, Okell TW, Hendrikse J, Bokkers RP, van Osch MJ. Validation of planning-free vessel-encoded pseudo-continuous arterial spin labeling MR imaging as territorial-ASL strategy by comparison to super-selective p-CASL MRI. Magn Reson Med. 2014 Jun;71(6):2059-70. Hartkamp NS, De Cocker LJ, Helle M, van Osch MJ, Kappelle LJ, Bokkers RP, Hendrikse J. In vivo visualization of the PICA perfusion territory with super-selective pseudo-continuous arterial spin labeling MRI. Neuroimage. 2013 Dec;83:58-65. Donahue MJ, Hussey E, Rane S, Wilson T, van Osch MJ, Hartkamp N, Hendrikse J, Ally BA. Vessel-encoded arterial spin labeling (VE-ASL) reveals elevated flow territory asymmetry in older adults with substandard verbal memory performance. J Magn Reson Imaging, 2014 Feb;39(2):377-86. D'haeseleer M, Steen C, Hoogduin JM, van Osch MJ, Fierens Y, Cambron M, Koch MW, De Keyser J. Performance on Paced Auditory Serial Addition Test and cerebral blood flow in multiple sclerosis. Acta Neurol Scand. 2013, Nov;128(5):e26-9. Schmid S, Ghariq E, Teeuwisse WM, Webb AG, van Osch MJ. Acceleration Selective Arterial Spin Labeling. Magn Reson Med. 2014 Jan;71(1):191-9. Helle M, van Osch MJ, Rüfer S, Nabavi A, Alfke K, Norris DG and Jansen O. Superselective arterial spin labeling applied for flow territory mapping in various cerebrovascular diseases. J Magn Reson Imaging, 2013 Aug;38(2):496-503. Knutsson L, Ståhlberg F, Wirestam R, van Osch MJ. Effects of blood ΔR2* non-linearity on absolute perfusion quantification using DSC-MRI: Comparison with Xe-133 SPECT. Magnetic Resonance Imaging, 2013 Jun;31(5):651-5. Donahue M, Ayad M, Moore R, van Osch MJ, Strother M. Relationships between hypercarbic reactivity, cerebral blood flow, and arterial circulation times in patients with moyamoya disease. J Magn Reson Imaging, 2013 Nov;38(5):1129-39. Zhang X, Petersen ET, Ghariq E, De Vis JB, Webb AG, Teeuwisse WM, Hendrikse J, van Osch MJ. In vivo blood T(1) measurements at 1.5 T, 3 T, and 7 T. Magn Reson Med. 2013 Oct;70(4):1082-6. Heijtel DF, van Osch MJ, Caan MW, Majoie CB, Vanbavel E, Nederveen AJ. Feasibility of arterial spin labeling on a 1T open MRI scanner. J Magn Reson Imaging. 2013 Apr;37(4):958-64. Khalili-Mahani N, Chang C, van Osch MJ, Veer IM, van Buchem MA, Dahan A, Beckmann CF, van Gerven JM, Rombouts SA. The impact of "physiological correction" on functional connectivity analysis of pharmacological resting state fMRI. Neuroimage. 2013 Jan 15;65:499-510. Bokkers RP, Hernandez DA, Merino JG, Mirasol RV, van Osch MJ, Hendrikse J, Warach S, Latour LL. 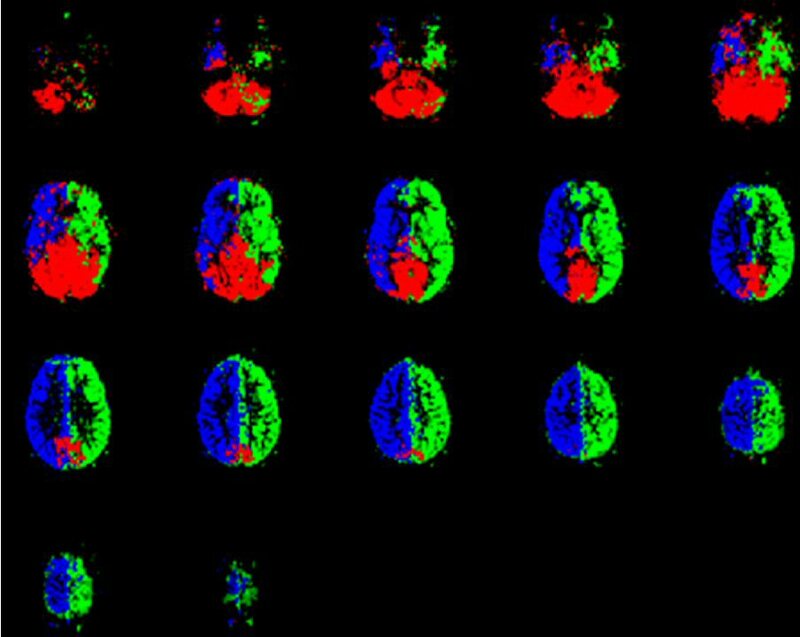 Whole-brain arterial spin labeling perfusion MRI in patients with acute stroke. Stroke. 2012 May;43(5):1290-4. Arkink EB, Bleeker EJ, Schmitz N, Schoonman GG, Wu O, Ferrari MD, van Buchem MA, van Osch MJ, Kruit MC. Cerebral perfusion changes in migraineurs: a voxelwise comparison of interictal dynamic susceptibility contrast MRI measurements. Cephalalgia. 2012 Mar;32(4):279-88. Sabayan B, Jansen S, Oleksik AM, van Osch MJ, van Buchem MA, van Vliet P, de Craen AJ, Westendorp RG. Cerebrovascular hemodynamics in Alzheimer's disease and vascular dementia: a meta-analysis of transcranial Doppler studies. Ageing Res Rev. 2012 Apr;11(2):271-7. Helle M, Rüfer S, van Osch MJ, Jansen O, Norris DG. Selective multivessel labeling approach for perfusion territory imaging in pseudo-continuous arterial spin labeling. Magn Reson Med. 2012 Jul;68(1):214-9. Korporaal JG, van den Berg CA, van Osch MJ, Groenendaal G, van Vulpen M, van der Heide UA. Phase-based arterial input function measurements in the femoral arteries for quantification of dynamic contrast-enhanced (DCE) MRI and comparison with DCE-CT. Magn Reson Med. 2011 Nov;66(5):1267-74. Taei-Tehrani MR, Van Osch MJ, Brown TR. Pseudo-random arterial modulation (PRAM): A novel arterial spin labeling approach to measure flow and blood transit times. J Magn Reson Imaging. 2012 Jan;35(1):223-8. Gevers S, Heijtel D, Ferns SP, van Ooij P, van Rooij WJ, van Osch MJ, van den Berg R, Nederveen AJ, Majoie CB. Cerebral Perfusion Long Term after Therapeutic Occlusion of the Internal Carotid Artery in Patients Who Tolerated Angiographic Balloon Test Occlusion. AJNR Am J Neuroradiol. 2012 Feb;33(2):329-35. Gevers S, Nederveen AJ, Fijnvandraat K, van den Berg SM, van Ooij P, Heijtel DF, Heijboer H, Nederkoorn PJ, Engelen M, van Osch MJ, Majoie CB. Arterial spin labeling measurement of cerebral perfusion in children with sickle cell disease. J Magn Reson Imaging. 2012 Apr;35(4):779-87. Bleeker EJ, Webb AG, van Walderveen MA, van Buchem MA, van Osch MJ. Evaluation of signal formation in local arterial input function measurements of dynamic susceptibility contrast MRI. Magn Reson Med. 2012 May;67(5):1324-31. Peng Q,Zhang Y, San Emeterio Nateras O, van Osch MJ, Duong TQ. MRI of Blood Flow of the Human Retina. Magn Reson Med.2011 Jun;65(6):1768-75.
van Hell HH, Bossong MG, Jager G, Kristo G, van Osch MJ, Zelaya F, Kahn RS, Ramsey NF. Evidence for involvement of the insula in the psychotropic effects of THC in humans: a double-blind, randomized pharmacological MRI study. Int J Neuropsychopharmacol. 2011 Nov;14(10):1377-88. Gevers S, van Osch MJ; Bokkers R; Kies D, Teeuwisse W, Majoie C, Hendrikse J, Nederveen AJ. 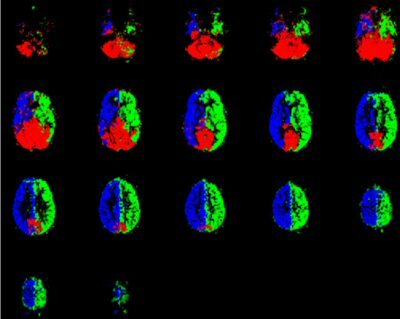 Intra- and multicenter reproducibility of pulsed, continuous and pseudo-continuous Arterial Spin Labeling methods for measuring cerebral perfusion. J Cereb Blood Flow Metab. 2011 Aug;31(8):1706-15. Gevers S, Bokkers R, Hendrikse J, Majoie CB, Kies DA, Teeuwisse WM, Nederveen AJ, van Osch MJ. Robustness and Reproducibility of Flow Territories defined by Planning-Free Vessel-encoded Pseudo-continuous Arterial Spin Labeling. AJNR 2012 Feb;33(2):E21-5. Bleeker EJ, van Osch MJ, Connelly A, van Buchem MA, Webb AG, Calamante F. New criterion to aid manual and automatic selection of the arterial input function in dynamic susceptibility contrast MRI. Magn Reson Med. 2011 Feb;65(2):448-56. Hartkamp NS, Bokkers RP, van der Worp HB, van Osch MJ, Kappelle LJ, Hendrikse J. Distribution of cerebral blood flow in the caudate nucleus, lentiform nucleus and thalamus in patients with carotid artery stenosis. Eur Radiol. 2011 Apr;21(4):875-81. Emmer BJ, van Osch MJ, Wu O, Steup-Beekman GM, Steens SC, Huizinga TW, van Buchem MA, van der Grond J. Perfusion MRI in neuro-psychiatric systemic lupus erthemathosus. J Magn Reson Imaging. 2010 Aug;32(2):283-8. Helle M, Norris DG, Rüfer S, Alfke K, Jansen O, Van Osch MJ. Superselective Pseudo-Continuous Arterial Spin Labeling. Magn Reson Med 2010 Sep;64(3):777-86. Bleeker EJ, Webb AG, Van Buchem MA, Van Osch MJ. 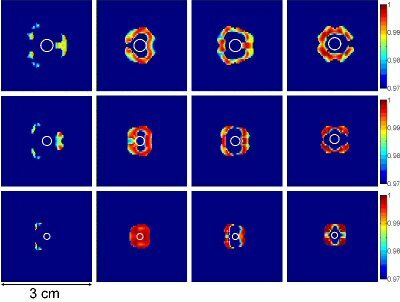 Phase-based arterial input function measurements for dynamic susceptibility contrast MRI. Magn Reson Med 2010 Aug;64(2):358-68. Van Osch MJ and Lu H. Arterial spin labeling perfusion MRI in Alzheimer’s Disease. Invited review for Current Medical Imaging Review. 2011. Feb;7(1): 62-72. Bokkers R, Van Osch MJ, De Borst GJ, Van der Worp HB, Hendrikse J. Symptomatic carotid artery stenosis: impairment of cerebral autoregulation measured at the brain tissue level with arterial spin-labeling MR imaging. Radiology. 2010 Jul;256(1):201-8. Yezhuvath US, Uh J, Cheng Y, Martin-Cook K, Weiner M, Diaz-Arrastia R, van Osch M, Lu H. Forebrain-dominant deficit in cerebrovascular reactivity in Alzheimer's disease. Neurobiol Aging. 2012 Jan;33(1):75-82. Teeuwisse WM, Webb AG, Van Osch MJ. Arterial spin labeling at ultra-high field: All that glitters is not gold. Invited contribution. International Journal of Imaging Systems and Technology 2010 Feb 20: 62-70. Bleeker EJ and Van Osch MJ. Measurement of cerebral perfusion using MRI. Invited review for Imaging in Medicine. 2010 Feb; 2(1): 41-61. Aslan S, Xu F, Wang P, Uh J, Yezhuvath U, Van Osch MJ, Lu H. Estimation of labeling efficiency in pseudo-continuous arterial spin labeling. Magn Reson Med. 2010 Mar 63(3):765-771.
van Osch MJ, Teeuwisse WM, Van Walderveen MA, Hendrikse J, Kies DA, Van Buchem MA. Can arterial spin labeling detect white matter perfusion signal? Magn Reson Med 2009 Apr;62(1):165-173. Calamante F, Conollely A., Van Osch MJ. Non-Linear ΔR2* Effects in Perfusion Quantification Using Bolus-Tracking MRI. Magn Reson Med. 2009 Feb;61(2):486-92. Calamante F, Vonken EJ, van Osch MJ. Contrast agent concentration measurements affecting quantification of bolus-tracking perfusion MRI. Magn Reson Med. 2007 Sep;58(3):544-53.